Father and son comic team Michael and Jack Whitehall are to tour south east Asia for a new Netflix travelogue. Travels With My Father will see the Backchat duo venturing on a "gap year route", taking them to countries including Thailand, Vietnam and Cambodia. Comedian Jack Whitehall first teamed up with his grumpy, uptight father - a former top London theatrical agent - six years ago for a comic chat show at the Edinburgh Fringe. Its success lead to the BBC Three series Backchat, a dual biography, and this new series will see them reunite once more. Posting on Twitter this afternoon, Jack asked for destination recommendations. He soon added: "Whitehall double-act started 6 yrs ago at Edinburgh fringe, now I'm taking this intrepid traveller on Gap yr to South East Asia [sic]." Co-produced by Tiger Aspect and Cave Bear, the companies and producers are also behind Backchat, Jack's sitcom, Bad Education, and upcoming comedy dramas Bounty Hunters and Decline And Fall, both of which will star Jack Whitehall. The six part series will follow the comic-travelogue success of TV programmes such as Russell Howard & Mum: USA Road Trip, and Romesh Ranganathan's Asian Provocateur, which has broadcast two popular series to date. The commission also follows the likes of Lovesick, Katherine Ryan In Trouble and stand-up Jimmy Carr's most recent live show, Funny Business, in being original British content bought by the US streaming giant. Comedy website Chortle reports that Travels With My Father "will follow the comic as he finishes the gap year he began in 2009, when a friend's motorcycle accident and his place in the Laughing Horse new act competition final prompted him to leave India after a couple of weeks". Speaking to the site, Jack explained: "[My father is] agoraphobic, well, everything phobic and it's going to be weird for him because he hasn't really done anything like this before. We're taking odds as to how long he lasts. I asked him which bit he's looking forward to the most and he said 'the plane touching down at Heathrow'." 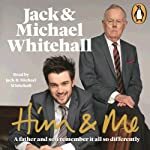 Jack Whitehall and Michael Whitehall perform their laugh-out-loud autobiography Him & Me as a unique dual-voiced comedy audiobook, filled with ad-libs, asides, and comic dialogue to create a uniquely funny listen.